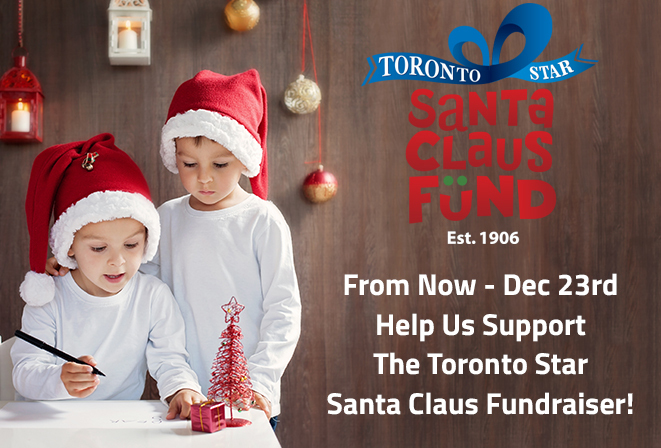 The Toronto Star Santa Claus Fund was established in 1906 as a means of providing gifts for underprivileged children during Christmas; this was initiated to ensure that no child would be without a gift during that festive season. The residents of Toronto and area responded generously that year, and have continued to donate every year for more than a century. This holiday season, the goal of the Toronto Star Santa Claus Fund is to raise more than $1.7 million to purchase merchandise for 45,000 gift boxes, with each gift box containing a warm shirt, hat, mittens, socks, a small toy, a book, candy, and dental hygiene items. The staff from Carrocel fine furniture in Toronto will be contributing to this goal through the kind support of our friends and customers. All we ask is that you take a moment to Like Us on Facebook; Carrocel will then donate $1.00 to the Toronto Star Santa Claus Fund for every Like* we receive on our Facebook page from now to December 23, 2016, with all proceeds going directly to the Fund. That’s all you need to do to help the Carrocel team provide underprivileged children with a gift box at Christmas. For further information about to the Toronto Star Santa Claus Fund program, please see Toronto Star Santa Claus Fund. Feel free to contact us if you have questions about Carrocel’s support of this charity.